It’s coming up on a year since I first started using ArcGIS Pro at the Center for GIS at Towson University. 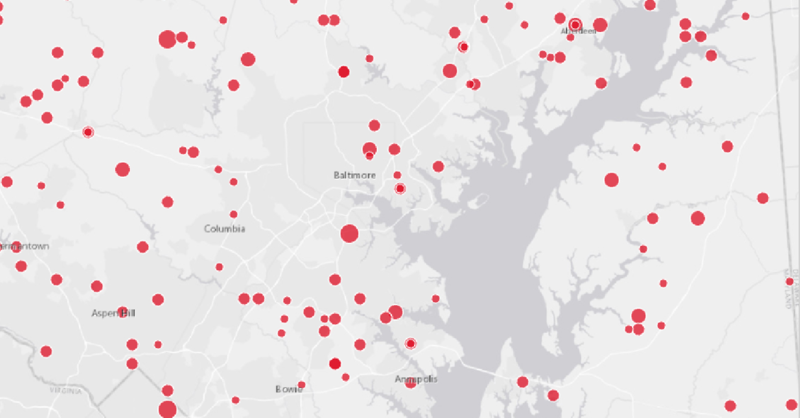 Esri recently released Pro 2.1 so I figured it was time to share some of the things I’ve learned in the past year of learning Pro and introducing it to others through the Maryland Statewide GIS Training Program. Although I still use ArcMap for some existing projects, I am increasingly drawn to Pro for its enhanced charting, symbology, and display capabilities. 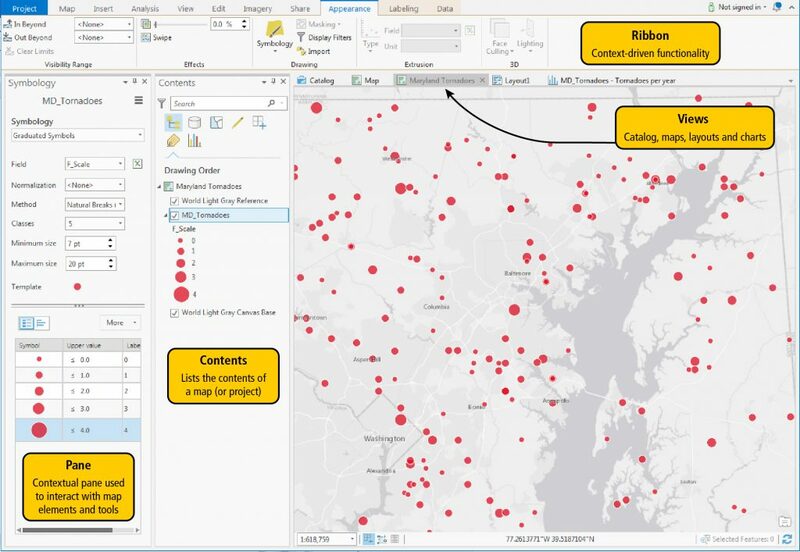 Here are a few things to know when switching over to ArcGIS Pro. Pro is faster. As long as your machine is above the recommended specs (make sure your display driver is up to date), Pro will be faster. For intensive maps, I spend much less time waiting for my maps to redraw between operations. Look to the ribbon. Pro has contextual ribbons that change depending on what you have selected. For example, the ribbon will only display the symbology, labeling, or attribute table options when you have a feature layer selected. Interact using panes. When you open symbology options or a geoprocessing tool from the ribbon, it opens as a new pane. Panes can remain docked, can be floated, or set to auto-hide. Once you get used to it, this should mean fewer clicks as you create your map. Pro stores multiple maps and layouts in a single project file (.aprx). Esri refers to these as views, and they can be copied between projects. Catalog is built-in. Pro uses the Catalog pane to organize data and server connections relevant to the project. Use the favorites option (or create a template) to make common locations accessible in multiple projects. Navigation and identification is more intuitive. No more magnifying glass buttons! Identifying on map features and navigating the map is done using the mouse/Explore button. To zoom in to a specific area, hold the shift key to draw a zoom box (hover over the Explore button for more shortcuts). Import an MXD to get started. Maps and layouts created in ArcMap can be imported into a new or existing Pro project. Check back for more tips for using ArcGIS Pro for map layouts, geoprocessing, editing, and more! 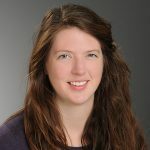 Christina Nemphos joined the Center for GIS team in 2008. As a GIS Specialist, she works to manage, map, and analyze spatial data from a variety of fields. Christina is currently pursuing an M.S. in Social Science, applying her interest in GIS to anthropology and environmental issues.